The name of that dicey dealer keeps popping up in stories of U.S. museum antiquities acquisitions gone bad. On trial in Italy for illicit antiquities trafficking along with the Getty Museum’s Marion True, Hecht had facilitated acquisitions of several ancient artworks now being sent back to Italy, including the Metropolitan Museum’s Euphronios krater and the Boston Museum of Fine Arts’ Sabina. Now he figures in the latest repatriation agreement, just signed by Princeton University. 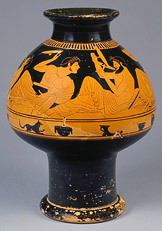 One of the Princeton objects set to return in four years’ time, a wine-cooling Greek vase attributed to 500 BC Athenian red-figure master painter Kleophrades [above], was sold to Princeton by Hecht. Italian police say that, like many objects, it was looted from the Etruscan site of Cerveteri north of Rome. She also declined to discuss any details of Princeton’s antiquities acquisition policy, which she said was tightened last year, using 1970 (the year of the UNESCO Convention on the Means of Prohibiting and Preventing the Illicit Import, Export and Transfer of Ownership of Cultural Property) as “the key date to determine the nature of documentation required” before an object is acquired. What specific kinds of documentation are needed in what instances? We don’t know. Princeton’s report of the agreement is here. Images and descriptions of three of the four objects being returned within 60 days, two of the four objects to be returned in four years, and three of the seven objects whose provenance was questioned but which will remain in Princeton’s permanent collection are here. Why not post images of ALL the objects to be returned, instead of just a sampling? Meanwhile, we’re still awaiting the list of “works of art of great significance and cultural importance” that Italy has promised to lend to Princeton as a result of this agreement. Cliatt said that Princeton had “thought we would be able to announce the objects,” which have been “largely agreed upon,” concurrently with yesterday’s formal signing in Rome. Italy is continuing its drive to reclaim its looted heritage. It has approached the Cleveland Museum of Art in America and the New Carlsberg Glyptotek in Copenhagen and is set to contact the Miho Museum in Shiga, Japan. Given Rutelli’s success rate thus far, I’d say those institutions may soon be preparing some packing crates. I was able to confirm that we’re anticipating posting our acquisition policies, but they are still in the revision stage and will be made available at the appropriate time.